When social scientists attempt to explain events in history, moral causes usually do not factor heavily in their analysis. There are good reasons for this: to a scholar with materialist sensibilities, there are always deeper and more powerful causes than what people claim to think. Instead, they argue we should study what people do rather than what they say motivates them; they claim we should count how they vote or what they spend money on first, and use those as the basis for working out what people really hold dear. A tendency to embrace this method holds across many different fields in the social sciences and it even extends in various ways into the humanities. While there are always challengers to this disposition, they often seem to remain at the fringes of discussion. Scholars like Richard Ned Lebow and Deirdre McCloskey have dedicated enormous energy to alternative accounts that incorporate ideas, beliefs, and character as causes in human events. These are books that should be read and discussed widely, yet as a professor I was often frustrated by the difficulty of finding short monographs that do similar work. 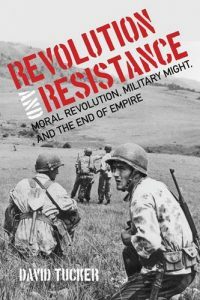 David Tucker’s Revolution and Resistance: Moral Revolution, Military Might, and the End of Empire (2016) offers a brief but compelling account of the role moral changes play on the world stage. Prompted to write the book by an editor who wanted a succinct account of why irregular warfare is so prevalent today, Tucker argues that to adequately address that problem, you have to grapple with the way that economic, political, and cultural forces interact to shape how peoples fight wars. He links the rise of irregular wars (or as he puts it, “chronic” as opposed to “acute” or conventional warfare) to the decline of European and American empire. Moral revolutions, in particular, were critical for both beginning and ending Euro-American empire and for making irregular warfare—particularly insurgency—an effective means of resistance. To be clear here, Tucker is not presenting a case for Western moral superiority. Instead, he offers a refreshingly honest take on all the parties he studies. He is unflinching in his presentation of every group’s moral failings. Tucker shines light on how enlightened Americans like Thomas Jefferson schemed against the Amerindian population, arguing that the United States should encourage them to incur debts that they could only repay by selling their land. But he’s just as willing to tell readers about how the Iroquois sought to extend their influence over others, how the Irgun terrorized British occupiers, and so on. Tucker’s key point is that moral differences between nations have an outsized role in determining how they relate to one another, what means they consider legitimate in conducting themselves, and even, whether they can understand each other’s actions in the first place. He organizes the book into four brief chapters, each focused on a distinct theme in the history of Euro-American empire, and they include conquest, revolution, resistance, and retreat. His goal in each is to trace the most important moral and material factors in play, and explain how they affected politics. Mercantilism had a shorter life than the imperialism it helped inspire. In the later stages of European imperialism, Europeans no longer generally assumed that one party’s gain had to be another’s loss or that the total amount of wealth was static. Generally, liberal views prevailed, which held that wealth could grow for all, domestically and globally, and that free trade domestically and internationally was a principal way to grow it. This theory reduced the need to use violence to enforce monopolies of trade, although it created the need for violence or the threat of violence to open markets, and, paradoxically, impose free trade. Economics matter because they reflect the priorities of a society, their attitudes and beliefs—their choices here quite literally demonstrate what they value. Conflicts emerged quickly between Europeans and their would-be subjects, but their varying levels of organizational sophistication, technological acumen, and their moral differences shaped the conduct of clashes between them. Tucker argues that what set Europe apart was “a way of life and a set of institutions that proved consistently more effective than any competitor at extracting power out of available resources” and a superior ability to project that power over time and space. In addition to tracing out the ways that moral differences shaped the contest between Europeans and the rest of the world, Tucker helps show the ways that the very conceptions of political and economic life that gave birth to imperial success would ultimately undermine it. The concept of rights was a source of power, but also offered those governed by Europeans a rhetoric with which to oppose authorities they saw as unjust. As time passed, the relationships between political and military power changed—largely for moral reasons. Empires that could once maintain control through by using violence as a tool, making examples of wayward or rebellious subjects, found their own populations increasingly unwilling to tolerate such violence. Imperial policing grew in difficulty, because “imperialists had a preponderance of physical force but a weak moral position,” while their anti-imperialist opponents “for the most part, had a strong moral position but inferior physical force.” This means that resisting empire is largely a matter of will. To succeed, resistance movements had to find means to counter the effects of the three aspects of imperial power: military force, commerce, and ideas. The primary means turned out to be guerrilla warfare, socialism, and nationalism, either secular or religious or some combination of the two. The great European going-out-over-the-world relied on convictions that weakened as empire grew. Technological power increased as moral certainty declined. Man-made technological power can now destroy the world, yet man-made norms cannot give it meaning. Post-imperial guilt is an epiphenomenon of the gradual hollowing out of Euro-American self-confidence.… The future, then, may be a contest between their [Islamists] solid conviction and the mere Euro-American desire for self-preservation, suggesting perhaps a worryingly unequal moral contest. Brian A. Smith is managing editor of Law and Liberty.